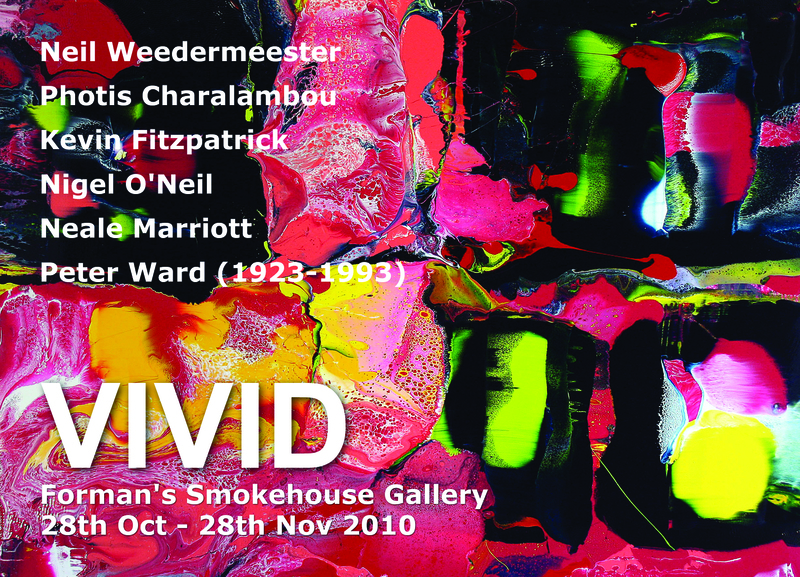 Vivid brings together six contemporary painters who explore and celebrate colour as a motivation for a renewed aesthetic reminding us of its central role in creating works of art that can remain independent of rhetoric and the illusory demands of representation. Each artist reveals in their own work their particular interests from minimal, geometric ,gestural, urban or digital an obsessive relationship with colour and to the pr…ocess of creativity effortlessly revealing the advantages of freedom of interpretation and inspiration. These works offer a refreshing critique of the transitory nature of information and interpretation where a chance encounter with paint or an accidental mark can lead to the unravelling of a new source of ideas each opening a new beginning, imagination without resolution image without text. To revel in the use of colour and to return to the desire and passion of painting this exhibition asserts not only the importance of painting in art but also the critical awareness of new urban abstraction and the role of the Artist in moving and shaping our society. Neil Weerdmeester’s paintings reference a common archive of abstraction drawn from a super 8 Polaroid past to a new digital society their seductive gloss finish invites the viewer to examine the very act of creativity. Neil Weerdmeester has a studio in Hackney Wick. Recent shows include Mark Jason Gallery NYC Art Fair, the Hackney Wicked Art Festival and Hammerson’s Artist Initiative. Photis Charalambou studied Fine Art at Middlesex University and has a Space studio in Hackney Wick. He has shown at Quicksilver Place Gallery (Performance: Making Space Visible/Invisible, 1999); Quicksilver Place Gallery (Drawing with Light: group exhibition of installation work stimulated by light & shadow, 2000); Euroart Studios (Open studio show, Oct 2004); Space Studios (Open Studio show, Sept 2009); The Changing Room Gallery (Solo show, June 2010). “Through the use of paint I give shape to intuitive and rational energies that inform my experiences in the world; allowing time to immerse myself in the process of painting touches on many levels of the human psyche. My use of colour is inspired by my interest in exploring the properties of light; where colour comes from. As a physical entity light retains a memory through the textures, marks and layers that I construct”. Nigel O’Neill lives and works in East London. He makes abstract paintings constructed from thin panels of birchfaced plywood these are then painted flatly with acrylic paint. Each painting consists of a number vibrant coloured planes. The shape of these planes evokes a perspective and illusionistic space on one hand. However this is undermined by the juxtaposition of different colours around a central plane. The different edges of this plane are pushed back or forward depending on the colour of juxtaposed planes. Therefore seemingly flat shapes appear to twist and flip back on themselves. This achieves a surface, which is simultaneously asserted and denied, undermining any logical or mathematical interpretation of the work. 1984 M.A. Fine Art CNAA Goldsmiths College London. 1978 B.A. (Hons) Fine Art 2-1 CNAA Stourbridge College of Art West Midlands. “I want the paintings to feel alive, to change, to surprise, and to vibrate. In a sense I am painting time and space as it passes, creating a distillation of place, or a series of places, of experiences and moods. Essentially they portray the abstract mix of the structures, colour, light and movement of our daily experience, one that contains both a sense of freedom and containment. The layers of paint are applied in thin veils of colour worked over steel, initially treated with chemicals to achieve coloured and textured patinas. This allows the metal base to shine through the painting, so that it has a physical, sculptural edge. Close to the surface, the sweeping, translucent layers of paint reveal small tumultuous details, where colours mix viscerally. In this way I aim to draw the viewer into the process of painting, creating both a contemplative and dramatic space to engage with”. ~ by smokehousegallery on October 13, 2010.